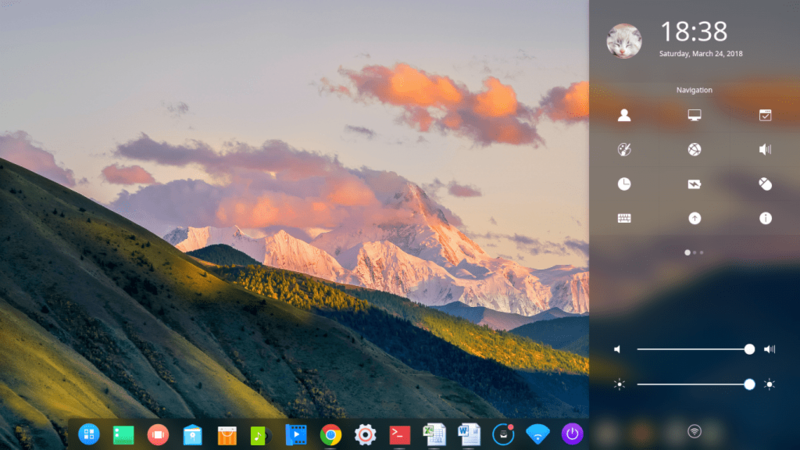 Deepin beautiful design. And yes, that’s Microsoft Office Excel and Word 2010 running there! After being stuck with Windows for quite some time already, I was thinking of switching OS for a change. And to be honest, I’ve always had a soft spot for Linux. But the only problem that always stopped me from switching over was the hardware devices I have around me which are not Linux compatible, and of course not forgetting the software as well. So when I had to replace my printer last year, I made sure that it must support Linux and make sure that I can print in the event I decided to make a switch. Another thing that stopped me was the office issue, I had no problems working using LibreOffice or OpenOffice. Just that the lack of support for the latest version of Microsoft Office always turned me off, that was when I’ve find out about WPS. So for the last couple of weeks, I’ve been trying a couple of different distributions to see if I can fully make a leap of faith. I first went with Ubuntu as it was the only Linux distro I was comfortable with during my earlier years. But somehow my laptop doesn’t seem too keen on using it. The Wi-Fi keeps disconnecting, not sure why despite trying on both 17.04 and 17.10. So I’ve decided to chuck it away, and go with Linux Mint, which also failed me due to the Wi-Fi issues. Did a search on it, and tried almost all the solutions didn’t seem to help. I went and tried Fedora, and boy it was a totally new experience for me. Again, I’ve decided not to stay with that because I was not able to use WPS Office on it. OpenSuse never really kicked off, because I couldn’t understand why the ISO I downloaded didn’t work both Tumbleweed and Leap. 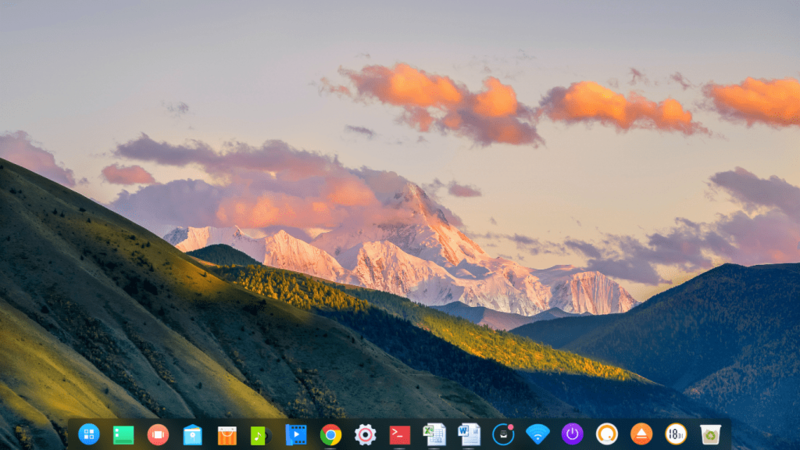 So I decided to search around, and found Elementary OS as well as Deepin. Settings on Deepin is not your conventional pop up folders. 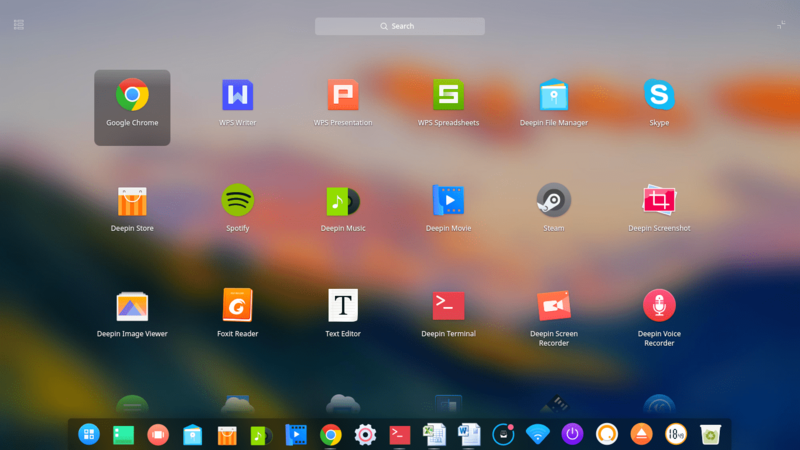 What caught my attention with Deepin was it’s eye candy design, as compared to Elementary OS which pretty much looked like Ubuntu especially the icons being used. So that’s when I decided to try and dual boot on my desktop first last night, and after using it for less than an hour I fell in love with it right away. Not only it runs on Debian (which is a plus for me), but it was simple and easy to use. In terms of installing and uninstalling software was a breeze on this distribution. And I was quite impress on how they’ve decided to do the settings on this OS whereby it slides out. Pretty much like Windows 10, but I like the fact that everything was in there, and you don’t need to go through pop up folders to reach to a specific settings. Maybe it’s just that I feel annoyed, if more folders keeps on cluttering on my desktop. So nice clean desktop is always a good to go for me, and probably make me feel productive for some apparent reason. Apps and software shows when you hit the launcher button. Heading on to the Launcher button, it straights away shows all the app and software that are currently installed on Deepin. And to my pleasure WPS came pre-installed with it. As I really had a hard time trying to install it on both Ubuntu and Fedora despite hours of googling. Considering that this distro built by China, so it would make sense to include their very own office instead of your common LibreOffice or OpenOffice. Another thing that surprised me was that they use Chrome instead of the commonly popular Firefox or Chromium for that matter. So I didn’t had issue browsing to sites, as compared to Firefox where I hit some roadblocks I wasn’t able to play some videos that was on the site. Pretty much everything just work right out of the box, and I decided to install a few software that I commonly used. 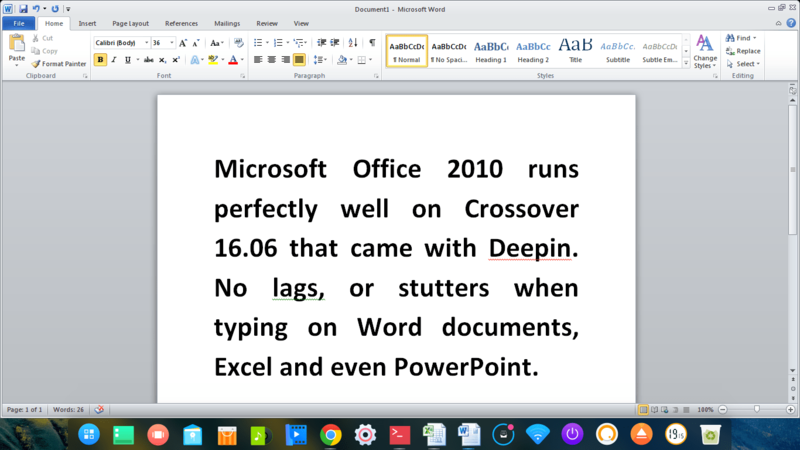 Microsoft Office 2010 works perfectly with Crossover. It works well with PlayOnLinux too which is free as compared to Crossover. One of it was Notepadqq, which I was glad that I was able to install it right from the Deepin Store. As I used to code quite a fair back, and Notepad++ was the most loved text editor software I used. Next up for me to install is MuseScore, which I use a lot for the last 6 months. So when I found out that MuseScore actually supports Linux, I know that chances of me switching over to Linux will be indeed sooner than later. So the last thing that struck the nail in the coffin for me to jump ship was actually the use of Microsoft Office, despite the fact WPS is already been installed in Deepin. I found out I could actually install Office 2016 using the latest version of Crossover. Little did I know that Crossover actually came pre-installed on Deepin, and the version they had running is 16.06. So after giving Office 2016 a try using Crossover 17.10, I’ve decided to abort mission all together. Due to the fact I went and conduct Microsoft Office 2010 training, I went and gave it a go to see if I can install on 16.06 instead as the latest version only gave me 2 weeks to try it out. And the experience of running Microsoft Office 2010 via Crossover was flawless so far. Maybe I’ll wait a few more months and keep an eye out on the latest development for Crossover, as I won’t mind purchasing the software if they could run Office 2016 as smooth as 2010. But there’s no rush for me to have it too since I have WPS. At this point, you could say I was pretty much gloating head over heels. As I also use quite a fair bit of OneNote, but since I can access the latest version through the web based version is fine by me. But most of my documents are currently being stored in OneDrive. And the last time I tried to set up OneDrive Free Client on Ubuntu 17.10 was a total disaster. Not sure what happened back then, but I’ve decided to give it ago again. I didn’t had much hope, but continued to set up based on the instruction from the site. In less than 10 minutes, files on my OneDrive began to download locally onto my laptop. After it completed syncing the server, I went and tried to make changes to the files to see if it would be able to sync. And I’m pleased to announce that, it worked perfectly! Final thoughts on this first impression is that, I think I won’t be heading back to Windows 10 anytime soon. One of my concern when conducting training is when I get USB Drive from my participants, it might be infected with malware. So I don’t think I’ll have that problem anymore in the future, and at the same time I could fix their Pen Drive with ease. With the lack of game supported on Linux, I believe I’ll be more productive despite the fact Dota 2 is supported as well. But I think I’ll have more fun working on this new machine, and probably raise a few eyebrows. Anyway, I’ll try to give myself 2 weeks on this and see how things plays out. If all is well, then I’ll stick to this OS for quite some time. And hopefully in a couple of months, Crossover will be more stable by then and maybe I’ll upgrade my current version to the latest one. But overall, very happy with my current set up now and we shall see how I progress from here. I have been using Deepin since 15.4 and it has been great. No more Windows for me, either. Deepin is elegant and fast. I am with you on the Debian base that is a big plus. I have encountered very few issues in my time with Deepin. I had similar issues with Linux Mint and Ubuntu is always buggy. I also use LMDE3 and the experience is night and day compared to the main edition. They should make LMDE3 the main edition. 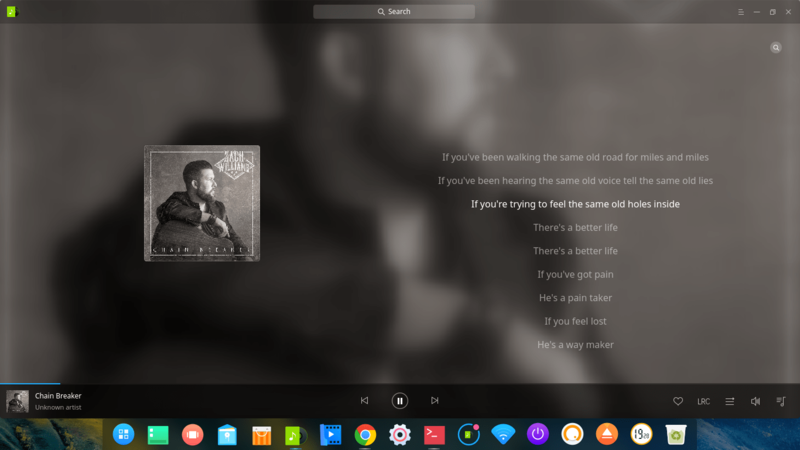 It, like Deepin, is great. I am convinced that the Ubuntu factor is the problem. I’ll give LDME 3 a try and see how it turns out for my older machines.